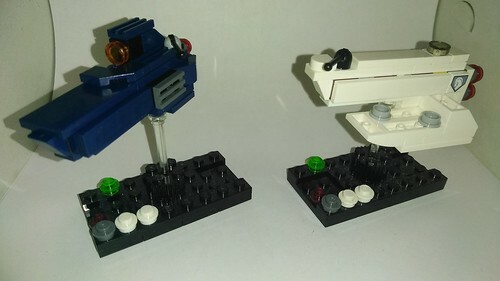 I got bored and made some random Light Carriers. I didn't know where else to put them and I have a feeling I might be making some more random vessels for IO so hence this thread. Feel free to add your own creations if you wish. Hope you all enjoyed and I eagerly await any and all comments you wish to share. 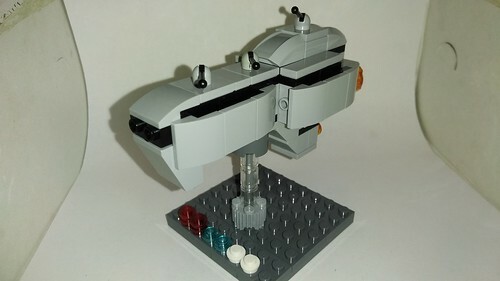 And if you wish to add your own random ship builds here, please feel free to do so. Those look very good! Simple, clean and to the point! Kinda like a more angular counterpart to Hyve's Nimbuses, might build something along these lines! 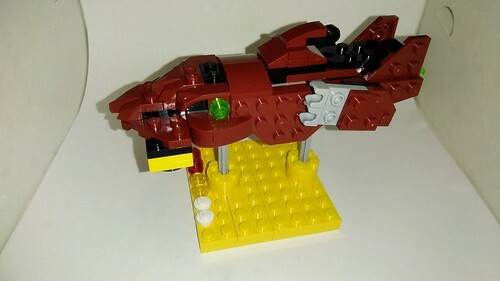 This design was a bit of a challenge as I tried to get the dimensions right, plus I had limited parts in the right color, but I am well pleased how it turned out. I'd like to thank HyveMynd for sharing the design, and I'd like to thank VitorFaria for the inspiration to try this build. I know it seems like I'm copying someone elses work, but I try to add my own little details to make it slightly different. I hope this is not a problem, and if it is, then I wish to know and I will correct it. 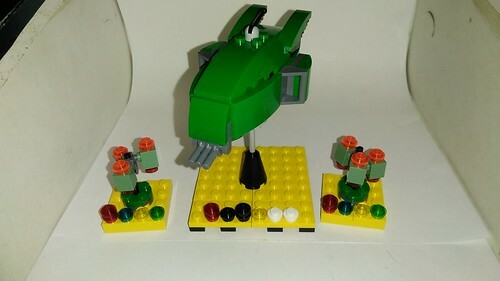 Love the color scheme and your engines assembly, might make it full circle and incorporate some ideas from it! VitorFaria wrote: That looks excellent, Artasid! Thank you VitorFaria, I'm glad you like the color and engine details, and I would love to see any ideas you get from it. I can provide a breakdown shot or LDD of the engines if you need. The Deimos Class Corvette was named after the Greek God of dread and terror. During it's first voyage, the ship came under attack from pirates that were determined to board and capture the vessel, however, with it's multiple Point Defense Turrets and heavily layered Armor Plates, the pirates and their boarding frames faced a difficult opposition and instead fled in disgrace. The dread of having to encounter this corvette again in close combat has given it its name. Though heavily defended, it severely lacks any offensive capabilities and must rely on nearby escorts to provide any counterattack. 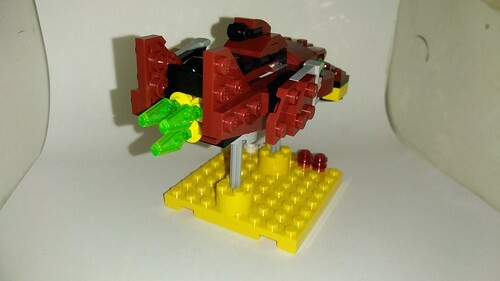 Though it is a capital ship, it has often been used as the defensive point of most fleets or as an armored transport for important individuals. This design was based off a vessel from an old space simulator game called FreeSpace2. I hope you enjoyed and I eagerly await any and all comments you wish to share. Really solid looking, Artasid! Gotta love all of that coherent armor! 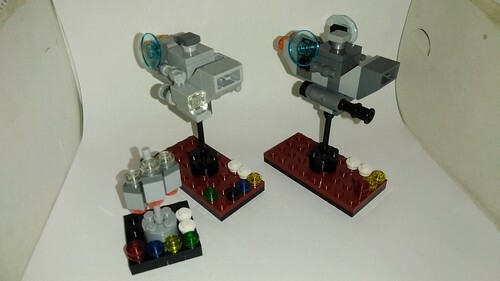 These are perhaps one of my simplest builds to date, but at the same time, very characteristic. I'm currently working on alternate loadouts for these, so I will keep you posted. 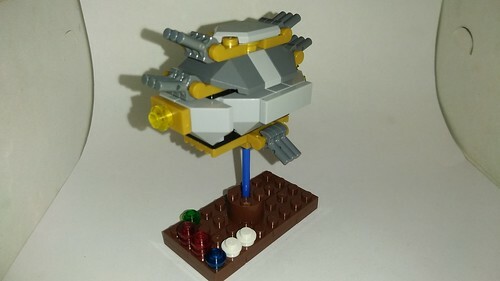 Sorry for all the random IO vessels lately, I've been out of ideas for Frames and I figured that instead of stagnating at my computer, I should try to refine my building skills for ships. I find myself using parts that I did not think to use and I think I'm imporving in building level, but I'll let you all be the judges. The Apex Carrier is essentially a flying pair of frame hangers. Some have givien it the nickname 'The Box" because it usually has a surprise inside, two frame companies. Unlike most other carriers, however, this one can also fill in a minor support role as it has two Support Range Beam Cannons, one over each hanger, to help discourage attackers from getting too close. Of course this also limits the Apex's capabilities, so it should never be without other supportive vessels. 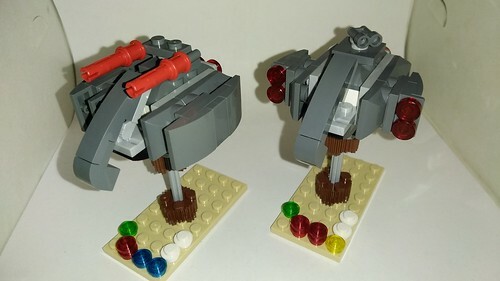 Apex: Dual Support Beam Cannons, 3Kd6 Dual Frame Catapults. Hope you enjoyed and as always, I eagerly await any and all comments, questions, insults, threats, or suggestions you wish to share. That carrier is deliciously beefy! Also, kind of a random note, seeing colored bases is very refreshing! Blue and purple look very distinct and yet still fit the space theme! VitorFaria wrote: That carrier is deliciously beefy! 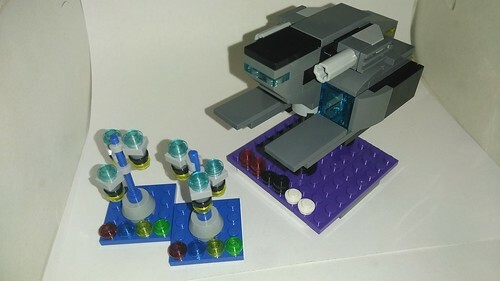 I was a bit worried that using the blue plates for the base would make it feel more like ocean/water craft than space vessels, but like you said, it makes for a distinct look. 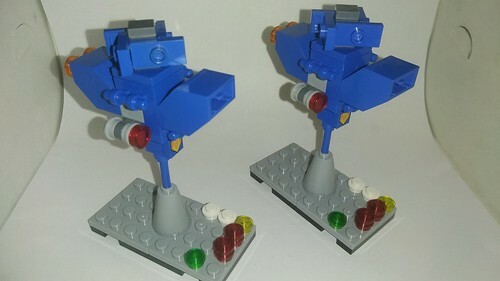 I would probably field these as support units, the left one for an emergency hanger/frame repair unit, and the Right as a long Range spotter/deterrent. 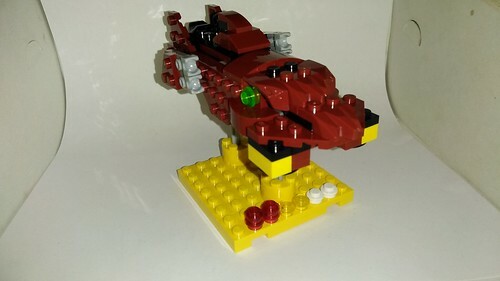 This next one was actually inspired by my LEGOShop Minibuild SSC that I did a long while back. Battle Shell: Lots of Assault Range Batteries, Extra Armor, Frigate Engines. 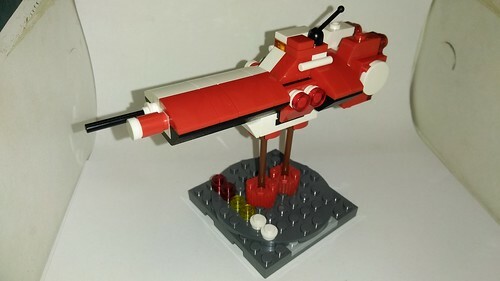 That minibuild SSC is surprisingly effective, it really does look like a nice battleship! Those Fenris frigates appeal to me a lot in gray, it helps to add some of that variation with the two grays. 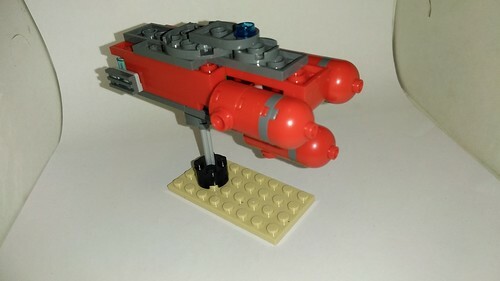 Aardvark17 wrote: That minibuild SSC is surprisingly effective, it really does look like a nice battleship! Thanks Aardvark17! The Fenris frigates are simple and easy, so making customized systems for them seems to be just as easy, which is what I like, and I think it'll work great for IO beginners as well. I have yet to make a LDD file for it, but I'm not sure it's really needed. Woah, that's super smooth, nice work! On one of the many Ijad inhabited worlds, there is an aquatic lifeform that humans have named "The Bladdercheek shark". The Ijadhi name for this creature can not be pronounced correctly in any human language. It is similar to terran sharks with the exception of two sac like bladders on either side of the creatures mouth. These bladders produce a sonar that allows the Bladdercheek to hunt food or to guide itself by means of echolocation, similar to that of bats and dolphins. This has made it an effective hunter. The Ijad, had constructed a capital ship in the likeness of this creature. Under its forward bow are two distinctive sonar domes to mimic the bladders, and it has been given long range torpedo tubes to take advantage of the range this targeting system can provide. As a side note, with the exception of the base and the stand, the entire build is an SSC from Lego Creator set 31073 Mystical Creatures. 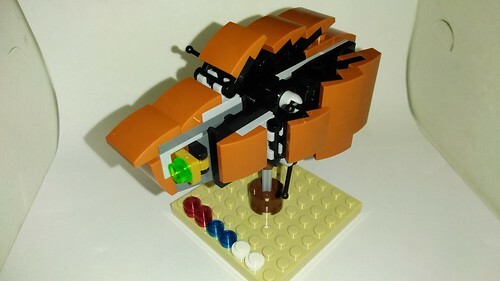 Great build, Artasid! Interesting to know it's basically a SSC! You got the marine creature theme spot on! What dose the diemos look like inside? VitorFaria wrote: Great build, Artasid! Interesting to know it's basically a SSC! Using the large ball joint/blocks from the set as the interior really helped. I didn't expect to get anywhere in terms of IO vessels with this set, but I am pleasantly surprised how wrong I initially was. SamSam wrote: What dose the diemos look like inside? Hope this helps and if not, please let me know and I will do what I can to make things easier. Haven't done many HVA's so I hope this one is acceptable. That's a killer HVA, looks a lot like a Star Wars support vehicle!